Kids need fun. That’s just a fact of life. But finding cost-effective toys and games can seem pretty tough. Here are a few ideas to make it easier! Drawing, even on on scrap paper, can create great wall and refrigerator art. Keep those crayons that come with kids meals, and you won’t have to buy a thing. You can also find affordable crayons, pencils, markers, paper, and coloring books at dollar stores. Card games. Look up the rules to various card games online. Many of them can be played if there are cards missing or by putting multiple decks together. It’s also fun to make up your own games with house rules. Play dress-up with things found at garage sales and thrift stores, and ask friends and relatives for old prom dresses, hats, scarves, or shoes. This is great creative fun that will provide hours of entertainment. Old-school fun. Some games, such as tag, jacks, marbles, dominoes, and hopscotch, have stood the test of time and have many variations. You have the freedom to modify them as much as you wish to make it the best game for your family. Chalk, dominoes, marbles, and jacks are easily found at dollar stores. Board games and puzzles. Look at thrift and consignment shops or yard, garage, rummage, and tag sales. Before you buy, inspect the contents so you can see if there are pieces missing. If there are, sometimes you can make your own replacements, or realize they aren’t necessary. You can even buy duplicates of the same game and combine the contents. 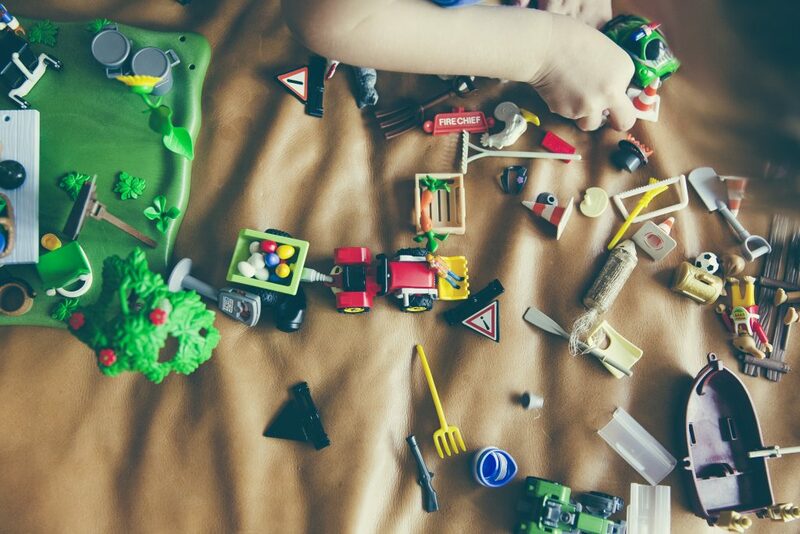 Keep spending to a minimum by looking for durable and versatile toys at garage, yard, rummage, and tag sales, or at thrift and consignment shops. In addition, many libraries now lend out toys and games the same way they lend out books. You can also try different add-on toys, such as trains, cars, horses, blocks, and LEGOS. Look on websites such as Listia for used toys, games, movies, and books. Make your own toys. For instructions and ideas, check websites such as Disney Family or Pinterest. Your local library is a great resource for DIY books, magazines, and classes. An easy toy to make only takes an empty water bottle or oatmeal canister and dried rice, beans, or beads. Fill the canister, seal it, and you’ve got a fun musical instrument. Retired teacher Monica Smith suggests lining up empty liter bottles at the end of a hallway and letting kids use a soft Nerf ball to bowl indoors! Use the local library! Libraries will have toys, movies, books, and even games for kids. They will also have lots of books for parents, filled with activity, craft, and toy ideas. Make your own activities. Feminists for Life President Serrin Foster remembers her mother, Donna, filling cans with water, grabbing some paintbrushes, and letting the neighborhood kids “paint pictures” on the sidewalk. “Not only was it inexpensive, there was no clean-up involved!” Foster says. She also suggests letting your little ones play with unbreakable pots and pans while a parent is in the kitchen (if you can put up with the noise)! Encourage creativity! When kids are imaginative and creative, they’ll never be bored. Make up stories, encourage imaginative games, and be positive about creative endeavors. Taking kids to the library and finding lots of books, especially the classics, can support creative and adventurous thinking.